Pinterest is here. And despite what many of you may think, it’s about more than pretty pictures. Pinterest is growing up, and it’s open for business. Making it the 4th largest source of traffic after Google, direct traffic, and Facebook. (source: Shareaholic) Add Pinterest to the top social media sites that you should continually monitor and update. I love the one by Bonobos. (Source: Burson-Marsteller) Relatively low compared to YouTube and Facebook, but when you consider the age of Pinterest (2.5 years), it’s actually quite impressive and is a number that should continue to climb. (Source: Pingdom) If your target market is primarily female then Pinterest is definitely for you. However, the number is starting to balance out across the sexes, with the female user base being 92% not long ago. (Source: Bloomberg) Consider adding the “Pin It” buttons to your website to get your users working for you and increase your viral coefficient. 5. Pinterest’s share of all site visits in North America increased 5,124% between July 2011 and July 2012. (Source: Experian) Remember the early days of Facebook and Twitter? Use this opportunity to get an early start on your competitors by leveraging Pinterest as soon as possible. The time for innovative business practices on Pinterest is now. (Source: Simply Measured) Don’t be surprised if Pinterest passes Google+ in 2013. (Source: Compete) Companies in the food industry should post pictures often to their Pinterest boards. And include a link back to their website in the description of the pinned photo. Adding a call-to-action to your photos will help your content pay off. (Source: comScore) We live in a visual world. Inspiring customers with photos and video will do wonders for your bottom line. By the way if you need professional photos or video, check out SmartShoot. (Source: Shop.org) Compared to 6.9 retailers on Facebook and 8.5 on Twitter. Sounds like an early WINterest to me. (Source: Shopify) Pinterest is now the 3rd most popular social network site in the world, and retailers can leverage its popularity to significantly increase traffic and sales. (Source: Shopify) Need some inspiration on how to structure your Pinterest account? Check out how Shopify does it – they even have a Chuck Norris board. (Source: Shopify) Couple this with the Zappos stat earlier and you have more proof that Pinterest drives real sales. (Source: Shopify) Sorry for all the Shopify stats, but I think they are interesting. It’s worth pointing out that Shopify reports that customers spend more and are more likely to purchase on Pinterest than any other social media site. 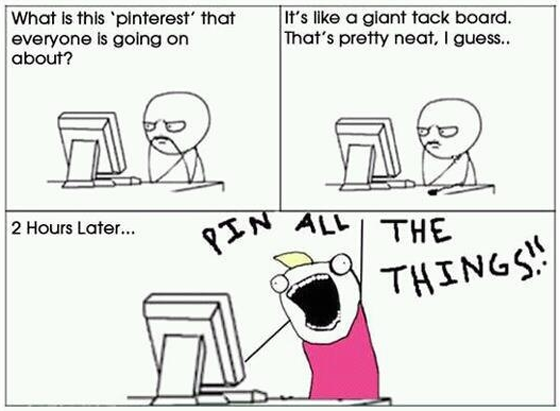 (Source: VentureBeat) It’s becoming clear that Pinterest is for sales, Twitter is for news and Facebook is for friends. (source: BlogHer) This is likely attributed to the strong community that Pinterest has built. (source: Experian) Retailers should focus more of their energy on Pinterest than Twitter and Google+. (source: Shareaholic) Copyblogger has a great post analyzing Pinterest traffic. (source: BlogHer) Encourage customers to share after their purchase when they are most likely to do it. (source: VentureBeat) Tip: It’s time to remove Digg and add Pinterest to the social share buttons on your site. (source: Nielsen) Retailers such as Babies R Us, Wittlebee, and Gilt are great examples of boards that target the mommy demographic. Share these stats with your followers. And don’t worry, you can change the tweet text before it goes out.